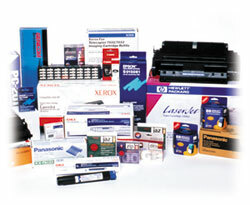 CDSI has toner and supplies for all your major brands of office equipment. It doesn't matter if you need supplies for your Savin copier or your HP printer, we have all of your supplies in one convenient location. Trust our experienced and friendly supply representatives each time you need to order your office supplies. CDSI provides you with a simple and quick process to get all of your supplies with No hassles or delays. Let our supply representatives stop by your office and give you a free confidential quote on your office supplies.